Decisions, decisions. Does anything in life require quite as many decisions as a wedding? For all its joy and promise and memorable moments, planning a wedding–particularly a destination wedding in Cabo San Lucas–involves a seemingly infinite number of decisions, from the design for the invitations to a thousand other small details…and of course some that are not so small. “I do,” for example, may be the words everyone is waiting to hear, and the words you as a soon-t0-be bride have waited all your life to utter, but it’s not the only “do” that matters. The bridal hairdo is also a subject of major importance. But don’t worry, destination brides. That’s where Suzanne Morel Face & Body Care comes into the picture. We’re home to the finest collection of beauty stylists in Los Cabos, from Suzanne Morel herself–raised in a family of beauty salon owners, and founder of her own cosmetics line–to her talented staff of hair and makeup artists. 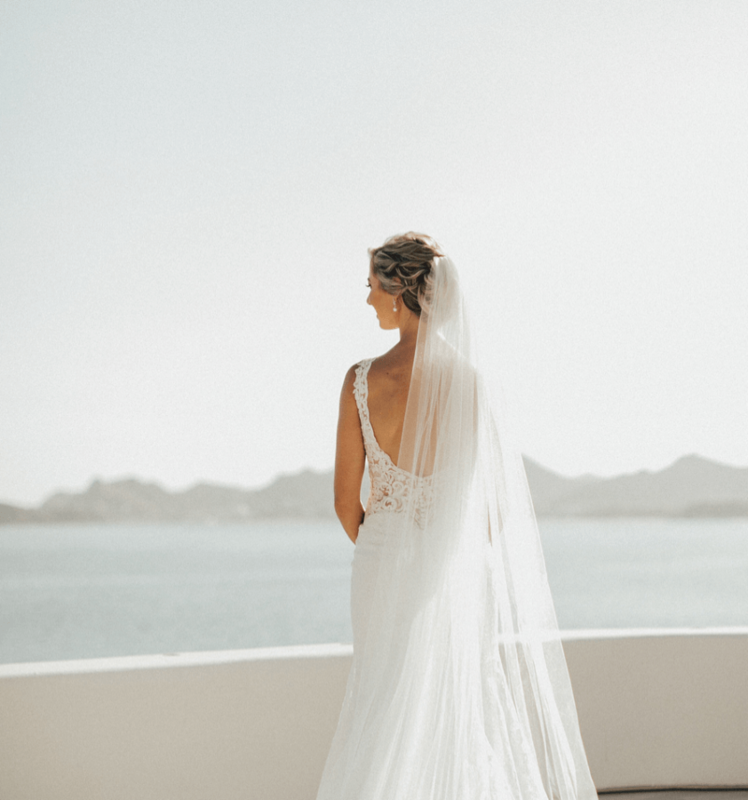 Our beauty squad is at your beck and call when the big day arrives, but first we’ll share everything you need to know about bridal hairstyles in tropical Cabo San Lucas, and maybe even answer the biggest question since the one that put that ring on your finger: updo or down-do? Updos are a wedding classic, and for good reason. Actually, for a lot of reasons, but we’ll start with just two: 1) it’s far easier to keep your hair looking great…consistently great over a period of many hours…when it’s worn up; and 2) elegant updos like chignons really show off your face and your dress to marvelous effect. Both reasons are “evergreen”–meaning they’re true at all times in all locations–but we’d argue they’re amplified when discussing a Destination wedding in Cabo San Lucas, a tropical getaway that boasts year-round sunshine…and a place where outdoor ceremonies are extremely popular. 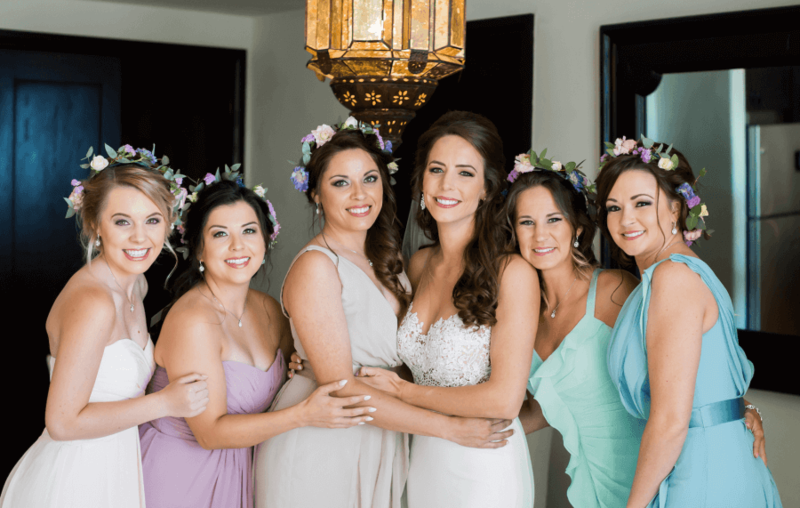 Updos are cooler and easier for the bride in warm weather locales like Cabo San Lucas, and the fact that they hold up so well has very real consequences in terms of photography and videography. You’re going to want to document every second of your destination nuptials, of course, and one of the most important lessons we’ve learned from years of doing hair and makeup is that there are no “do-overs”….Photoshop doesn’t work when it comes to wedding hair. So the fact that updos hold their shape so well, and for so long–from the first notes of The Wedding March to the last dance of the reception–is in and of itself a persuasive argument for their use as a wedding hairstyle. But there’s also the fact that updos look fantastic with a wide variety of wedding dresses, from the sort of high-collared gowns that are rarely seen in Cabo San Lucas to those that are off the shoulder, or with thin straps and open backs, that are perennially popular in warm weather settings. Did we mention updos also keep your hair out of your eyes, and away from your perfectly applied make-up? The case for down-dos is less about practicality than personal choice and what feels natural. For many women who’ve always worn their hair down, changing it for one day–their destination wedding in Cabo San Lucas–just doesn’t feel right. That’s not simply a comfort decision, but also a reflection of personality and personal style. And let’s be honest: Updos may suggest elegance, but for sheer glamor, you can’t beat a down-do. Down-dos look fabulous with gowns with plunging necklines, and there are a million variations that can be played with to match any dress style…from working in tresses, waves, curls and braids to adding accessories like tiaras and garlands of flowers. If you’re worried about curls holding their shape for hours on end in tropical heat, well that’s why you bring in the beauty squad from Suzanne Morel Face & Body Care. 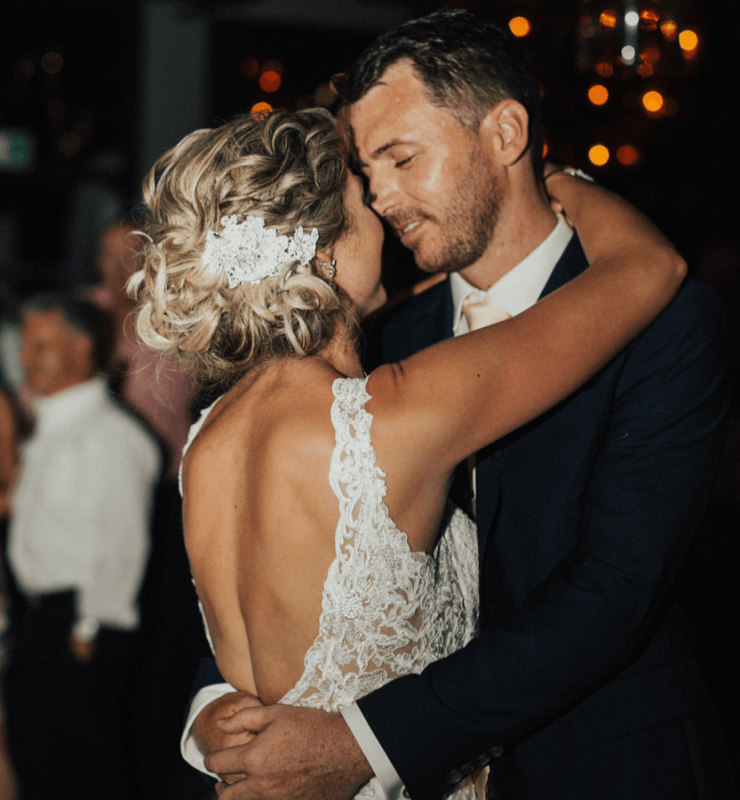 We’ll be with you for most of the day, from an initial styling session before the ceremony–which we recommend for the bridesmaids as well–to a touch up for hair and makeup between the ceremony and reception. Don’t let yourself be talked into anything. If you’ve dreamed all your life of walking down the aisle with long, luxuriant hair flowing behind you, that’s definitely what you should do. Still undecided? The nice thing about this particular debate is that there is middle ground, a compromise solution that offers the best of both worlds. That compromise is the half-up, half-down hairstyle, which in its most elegant manifestations marries the sophistication of an updo with the carefree bohemian chic of a down-do. 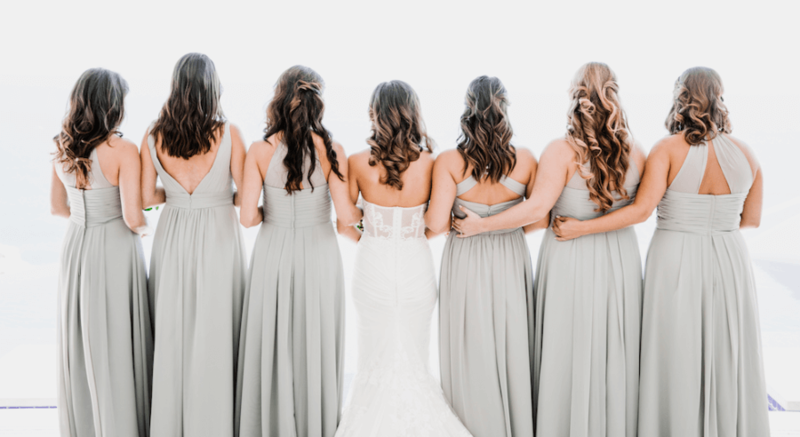 It’s a beautiful hairstyle choice for any “destination wedding in Cabo San Lucas,” and not just because it saves you from having to make one more difficult decision. The half and half is an extremely versatile hairstyle. It well with both buns and braids, and you can play around with it to maximize the relative strengths of both updos and down-dos, and to adapt the hairstyle to fit specific area conditions (like the tropical warmth in Cabo San Lucas). Decisions, decisions. Up or down, or half-up and half-down? This one is actually easy, though, and you’ve probably already made it without even thinking about it. You’ve been dreaming about your wedding day for most of your life. Maybe your sensibilities have changed over time, but most women have had a vision in mind of their wedding day since they were very young girls. The decision, in other words, has already been made, consciously or unconsciously. Whichever way you wore your hair in that long ago vision, that’s the way you should wear it for your destination wedding in Cabo San Lucas. This entry was posted in Blog, Cabo Bridal Hair and Makeup and tagged Destination Wedding in Cabo San Lucas, Hair Up or Hair Down.